Liquid Density Tower Physics Activity That’s Actually Easy To Make! There are tons of simple science and STEM activities that are so much fun for kids! We think making density towers is a little bit of science magic for the junior scientist but also incorporates a good dose of cool physics. 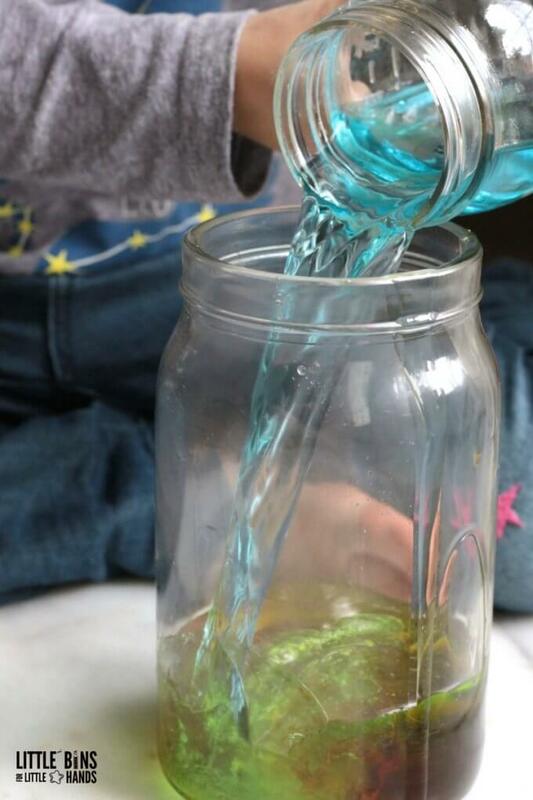 See how we set up super easy liquid density tower physics activity for kids! LIQUID DENSITY TOWER PHYSICS ACTIVITY FOR KIDS! We love using what we have around the house for cool science like this liquid density tower physics activity. Other density science ideas along the same line include our homemade lava lamp and our sugar water rainbow! You can read more about the science behind this physics experiment towards the bottom of this page. Let’s keep it basic for our younger scientists. Physics is all about energy and matter and the relationship they share with one another. Like all sciences, physics is all about solving problems and figuring out why things do what they do. Kids are great for questioning everything anyway. In our physics activities, some of the things you are going to learn a little bit about are static electricity, Newton’s 3 Laws of Motion, simple machines, buoyancy, density, and more! And all with easy household supplies. Encourage your kids to make predictions, discuss observations, and re-test their ideas if they don’t get the desired results the first time. Science always includes an element of mystery that kids naturally love to figure out! Learn more about using the scientific method with young kids here. Kids are curious and always looking to explore, discover, check out, and experiment to find out why things do what they do, move like they move, or change like they change! Indoors or outdoors, science is out amazing! Science surrounds us, inside and out. Kids love checking things out with magnifying glasses, creating chemical reactions with kitchen ingredients, and of course exploring stored energy! 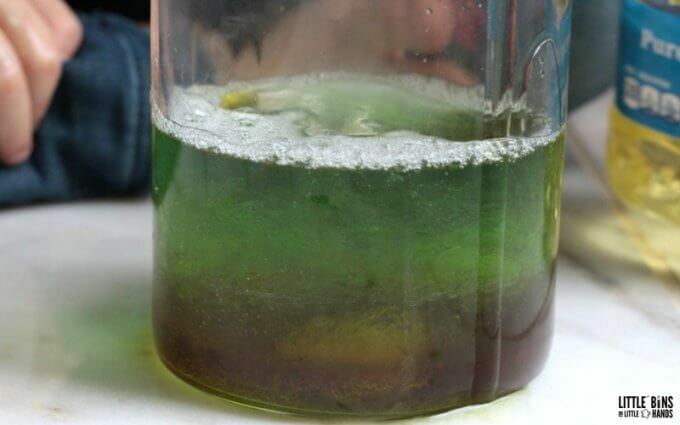 Check out 35+ awesome science projects to get started. There lots of easy science concepts that you can introduce kids to very early on! You might not even think about science when your toddler pushes a card down a ramp, plays in front of the mirror, laughs at your shadow puppets, or bounces balls over and over again. See where I am going with this list! What else can you add if you stop to think about it? Science starts early, and you can be a part of that with setting up science at home with everyday materials. Or you can bring easy science to a group of kids! We find a ton of value in cheap science activities and experiments. Let’s get started and gather our supplies needed for this density activity. I like to think it’s as simple as heading to the kitchen! You can also experiment with adding honey and corn syrup and even an ice cube! You will find that some density tower experiments have a very specific and careful way to add the layers, but ours is a bit more kid friendly! The first thing I suggest you do after you gather your ingredients is to have your kids make some predictions and come up with a hypothesis. You can read more about the scientific method and find a free printable too. Make sure to get their thoughts on what will happen when you add the liquids to the jar? Will they all just mix together for a big mess? Are some liquids heavier than others? 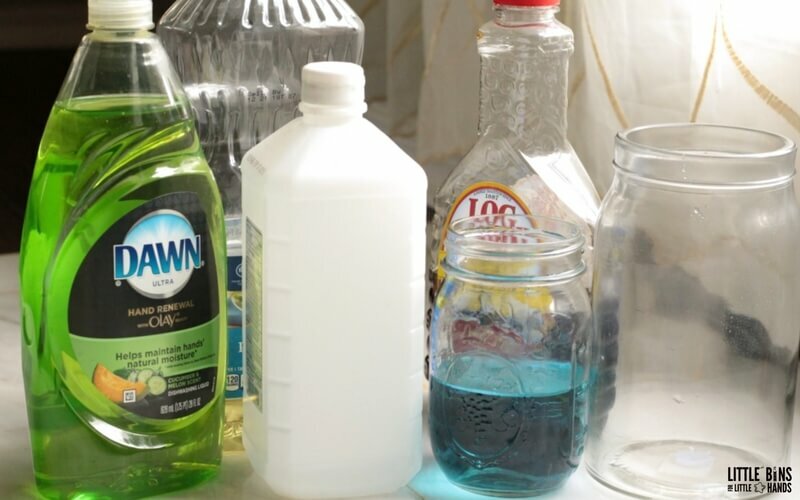 Have your kids put the liquids in order from heavy to lightest as you talk about each one! There are two ways you can go about building your liquid density tower physics activity. First, you can add the ingredients in the order the kids put the liquids. Second, you can order the liquids yourself. Again this depends on your needs! I am going to outline the second way below. First, add your ingredients from heaviest to lightest. Here we have the heaviest being syrup, then dish soap, then water (color the water if desired), then oil, and lastly alcohol. 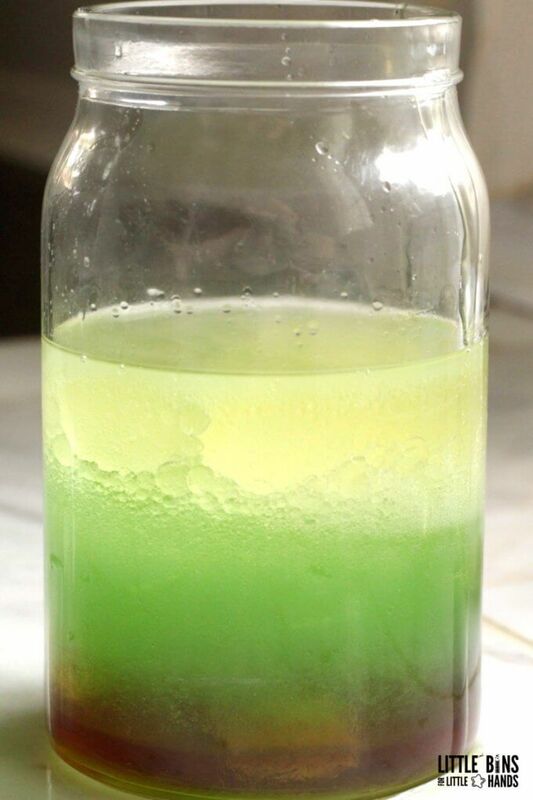 After the layers separate, add a drop of food coloring to the alcohol layer. 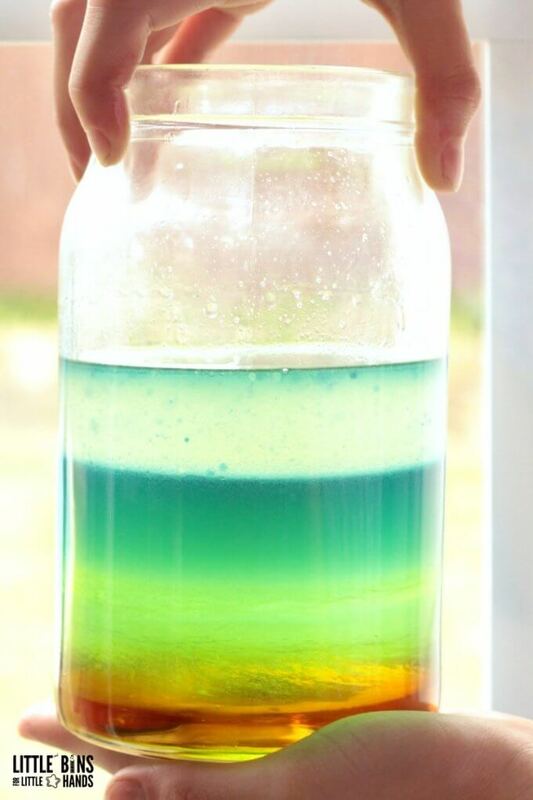 The food coloring will mix between the alcohol layer and the water layer, making the layers more distinct and pretty! Or make it spooky as we did here for Halloween. Check back in with your kids and see if their predictions are correct, what they observed, and what conclusions they can draw from this physics activity! Read more about the science below! The final shot of this cool physics activity, a liquid density tower. Let’s take a look at some simple science behind the activity. We know that our liquid density tower deals with matter, liquid matter (matter also includes solids and gasses). Matter has different densities meaning some will be heavier and some will be lighter. It’s hard to imagine that different liquids have different weights, but they do! Why do some liquids weigh more than others? Like solids, liquids are made up of different numbers of atoms and molecules. In some liquids, these atoms and molecules are packed together more tightly resulting in a denser or heavier liquid like the syrup! These different liquids will always separate because they are not the same density! That’s pretty cool, isn’t it? I hope you explore science at home and test out some awesome physics concepts too. Previous Post: « Valentines Day Slime Recipe To-Go with Printable Labels!